Discover Essaouira on a unique one-day tour leaving from Marrakech. During this excursion, you can visit the old medina of Essaouira, the port and the Scala and the Argan woman’s co-operative, eat traditional dishes, and see its beach and the city gates. After lunch and a rest stop, we will head back to the hotel, arriving about 8:00 pm. Travel from Marrakech to Essaouira and Lose yourself in this Moroccan Atlantic paradise and retreat of stars like Jimmy Hendrix. Discover the port and the walled enclosure of the Scala, cross the picturesque streets of the Medina, and discover its refined crafts. If you like fish, take the opportunity to enjoy a tasty meal in the port. Discover for yourself why Essaouira is called “The Pearl of the Atlantic“. This day trip to Essaouira starts with an early departure from Marrakech. We will pick you up at your hotel and head to Essaouira, “The Pearl of the Atlantic.” We arrive at this walled city in about 3 hours. There you can enjoy the unique beauty Essaouira offers, a paradise for surf lovers, and an inspiring corner for many artists such as Jimi Hendrix and Orson Welles. During your excursion to Essaouira, you will have plenty of free time to travel around the city. You will be given directions and recommendations for the most beautiful places to see. They include the ancient port of Essaouira and the Scala, an 18th Century bastion that defended the city of Essaouira. From the top of the bastion, you can enjoy spectacular views of the Atlantic. Also, you can lose yourself in the lively streets of the famous Medina, featuring the traditional white fishermen houses, soaking in its characteristic Bohemian atmosphere at the same time. 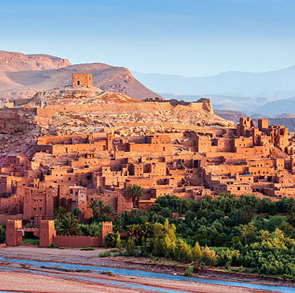 Discover the city tradition of refined craftsmanship on this day trip from Marrakech. and enjoy a quintessential image of Essaouira: the return of the fishing boats to port. In addition, if you love seafood, take advantage of the opportunity to enjoy the fresh fish in the typical restaurants along the seafront.